RJ Balaji, is not just known for his sense of humor and wit but also for his socially responsible activities. He has made his presence felt in films like Naanum Rowdy Dhaan, Vadacurry, Idhu Enna Maayam and Pugazh to name some. He will soon be seen in ace director Mani Ratnam’s next. RJ Balaji shared this information in his social media page which read as, “And this did happen for real.Grew up watchin his films n now to be part of a Maniratnam Film. Feels like a dream!☺”. He further elaborates exclusively to behindwoods, “Yes, I am in Mani sir’s film. I am not able to express myself and choose the right words. To put it simply, I am very happy. I was in an awards function overseas when I got a message regarding this. It was such a pleasant shock to me. After I came to Chennai, I met Mani sir and he spoke to me for around half an hour narrating the role to me. Whatever had happened afterwards, I could not believe it at all. I just took a picture with him and posted. For someone who has grown up watching his films Thalapathy, Nayakan, Anjali and the likes, to get an opportunity to work with him is something akin to magic. For example, we all would desire to have FDFS tickets for Kabali, but we won’t normally dream of being in Kabali. For a middle class boy like me, it is something like that; it is not even a dream come true, it is more than that. I am naturally looking forward to it." We wish you the best Balaji! Rock it! 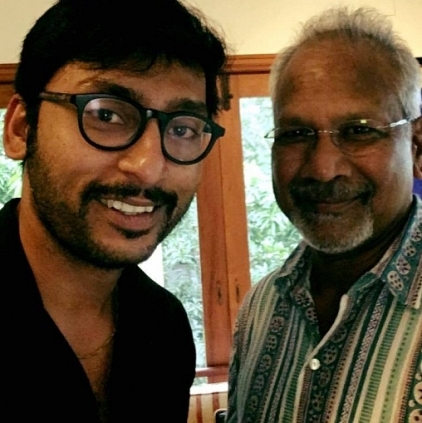 People looking for online information on Mani Ratnam, RJ Balaji will find this news story useful.